Snakes have flexible backbones made up of vertebrae and ribs, skulls and jawbones with teeth. Two ribs attach to each vertebrae, with the exception of the tail, which has no ribs. Bony projections of the vertebrae on the front and rear ends of the backbone lock the end vertebrae in place, allowing for flexibility of the backbone but preventing it from slipping out of place. A snake’s ribs do not join but have free ends. This allows expansion for ingesting large prey, as well as compression in some species. For instance, when a cobra forms a hood, he is pulling his top ribs up. 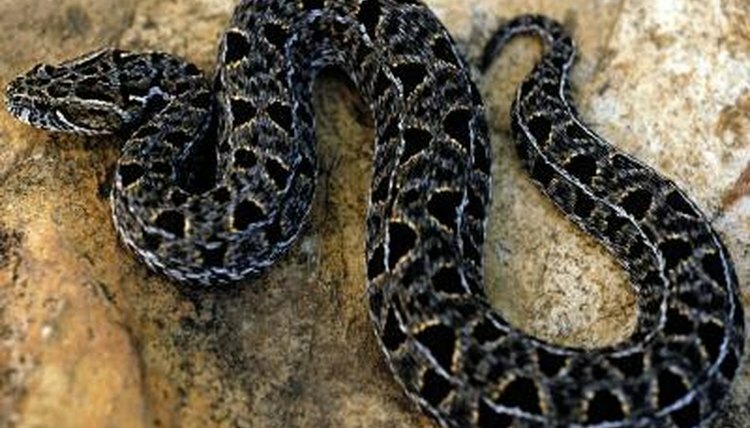 The hognose snake pulls in his ribs to flattens himself in a defensive mechanism. The lack of breastbone also aids in allowing the snake to ingest prey. Loosely attached to the skull with stretchy ligaments are highly specialized jawbones that allow the snake to capture and ingest prey much larger than his mouth. Four separate jaw elements can move individually, which means the snake can open wide sideways as well as vertically. The lower jaw stretches away from the skull, allowing the snake to swallow prey much larger than his head. The bones at the front of the jaw are not fused together, so a snake basically “walks” prey into his mouth, alternately moving the jaws on each side. Pythons and boa constrictors have vestiges of hind legs know as pelvic spurs, along with small internal bones in the pelvic area. These spurs are better developed in males and are small or absent in females. Males have control over these vestigial legs and use them in courtship to hold the females.